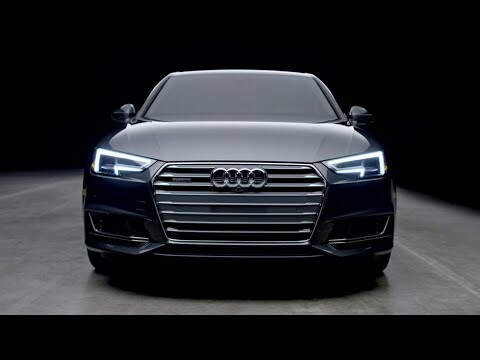 From the redeveloped engine to the available Audi virtual cockpit, technological innovations found throughout the 2017 Audi A4 provided inspiration for the precise and striking design details of the all-new sedan. The exterior has been redesigned to feature sportier proportions including a horizontal, contoured Singleframe® grille, powerful wheel arches and a crisp wrap-around shoulder line which flows seamlessly from the hood to the rear of the vehicle. The interior has a greater feeling of spaciousness and lightness due to a three-dimensional decorative inlay that spans from the door panels across the dashboard. Featuring a completely redeveloped powertrain, the 2.0 TFSI® engine can generate 252 hp and 273 lb-ft of torque. A significant weight savings was achieved through the aluminum-hybrid lightweight construction. The A4 also features a suite of advanced infotainment functions including the available Audi virtual cockpit and a newly designed infotainment system with standard Audi smartphone integration, which supports Apple CarPlay™ and Google™ Android Auto. An available 19 speaker, 755 watt Bang & Olufsen 3D Sound System virtually creates a sense of sound dimensionality offering a revolutionary, life-like musical experience. With exceptional attention to detail, dynamic handling, sharpened design and the latest technologies, the ninth generation A4 sets a new standard in the luxury sedan segment. The powertrain and chassis of the all-new A4 have been completely redeveloped, allowing for a sportier driving experience and more comfortable ride for long distances. The newly developed S tronic® dual clutch transmission melds efficiency with dynamic shifting characteristics to help optimize fuel consumption. New front five-link suspension allows for greater steering precision and excellent handling through optimized steering-rack placement direct at wheel centers. Handling and comfort enhancements have also improved through the reduced unsprung weight of lightweight aluminum control-arm components and revised elastokinematic attributes. The all-new A4 represents the latest refinements in Audi design, from the crisp, wrap-around lines emphasizing the vehicle’s length to the powerful wheel arches that accentuate the vehicle’s performance appeal. The front of the A4 boasts the signature Singleframe® grille which adds depth and sporty character and a newly designed clam-shell hood which flows seamlessly into the shoulder line, giving the A4 a dynamic stance. The available Audi LED headlights with progressive undercut design provide a focused look and give the A4 an unmistakable appearance. With the introduction of LED technology on the Audi R8 and A8, which was then brought to the mass market on the A4, LED headlights are an Audi signature and have become an industry standard. The refined interior of the A4, reminiscent of the award-winning interior in Audi’s flagship sedan, the A8, includes greater attention to detail through functional refinements and additional driver-focused technologies. The acoustic windshield was designed to help keep cabin-noise to an exceptionally low level and standard ambient LED interior lighting creates a positive sense of space and highlights the high-quality materials throughout the interior. In addition, the all-new A4 features improved interior space with increased shoulder and head clearance for the driver and front-seat passenger as well as increased rear legroom. The Audi A4 offers benchmark infotainment features such as the available Audi virtual cockpit and for the first time, a full-color head-up display, both bring relevant driving information directly front and center for the driver. Available Audi virtual cockpit features a large, 12.3-inch display that delivers vibrant color at 60 frames per second with NVIDIA® quad core processing power. The virtual cockpit helps make viewing and navigating via the large Google Map images supported with 4G LTE (where available) easier on the drivers’ eyes. It also allows for a better view of the road ahead through full map display and a placement directly in front of the driver. A high mount 7-inch center MMI® display is standard or an available 8.3-inch with MMI Navigation Plus package. Available full-color head-up display, projecting relevant driving information directly in the driver’s field of vision. In addition to the traditional MMI® scroll wheel capabilities, the optional MMI all-in-touch (MMI® navigation plus package) features a completely redesigned menu structure and an all-new MMI search, which operates similar to an Internet search engine making text input simpler and quicker. Audi connect packages together all applications that connect the A4 with the internet, the owner and the surrounding infrastructure. New and improved functions include online traffic info, weather updates, fuel prices, Apple Siri® Eyes Free integration, internet radio streaming as well as picture navigation, read-aloud personalized news headlines and Twitter® alerts, among other features. The all-new A4 incorporates many driver assistance features that are designed to help drivers navigating the road and traffic while making their driving experience more enjoyable. In the case of an impending collision, Audi pre sense® basic can intervene to prepare the vehicle for impact. This process includes beginning to close the side windows and panoramic sunroof, pretensioning the front safety belts, and preparing the brake system for a quicker response during an unexpected or emergency maneuver. Standard Audi pre sense city detects cornering and stationary vehicles as well as pedestrians, at speeds of up to 52 mph and can initiate full braking when a potential collision is detected. Available traffic sign recognition including vehicle speed warning detects speed limits and displays the information in the Audi virtual cockpit or driver information system. Additionally, the system evaluates various driving conditions, no passing zones and school and construction zones. Vehicle exit assist (as part of Audi pre sense rear) can help prevent accidents with a side assist warning light, which blinks and notifies the driver when vehicles or cyclists are approaching from behind as the vehicle doors are opened. Rear cross traffic alert (as part of Audi pre sense rear) supports the driver when reversing out of a perpendicular parking space. Indicator arrows in the MMI® display can inform the driver of approaching vehicles, and in critical situations, a warning tone and brake jolt can be applied, prompting the driver to stop the vehicle. In the event that a sharp maneuver is needed to avoid a collision, collision avoidance assist supports the driver when turning into the adjacent lane. Turn assist (as part of the Driver Assistance package) can detect the approach of oncoming traffic, when making a left-hand turn at an intersection (when the vehicle is stopped or under 7 mph and turn signal is activated). *Prices above exclude destination charge ($950), taxes, title, options, and dealer charges. The all-new entry A4 starts at $37,300* compared to $35,900 for the outgoing model. This ninth generation A4 is now equipped with significant powertrain improvements and an expanded list of standard equipment including keyless start/stop, rearview camera, Audi smartphone interface, LED interior lighting, digital 3-zone automatic climate control and Audi pre sense city.